With basic education and childcare still inaccessible to millions of rural Indians, Anganwadi centers, which serve as "courtyard shelters" of each locality, have been playing an important role in development. These Anganwadi centers provide supplementary nutrition, non-formal preschool education, nutrition and health education, immunization, health checkups, and referral services. 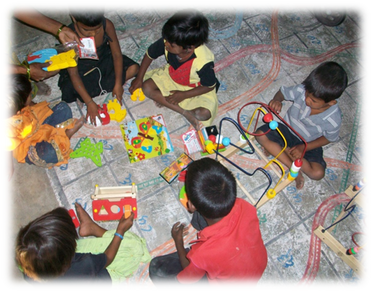 - Increase the attendance of students coming into Anganwadi centers. - Strengthen preschool services offered at Anganwadi Centers. - Offer high-quality English education at every facility. - Maintain high standards on par with private, for-profit institutions. - Provide training to all 52 Anganwadi teachers every trimester. Help them understand the Teaching and Learning Material (TLM) during these sessions. - Create a well-rounded syllabus that motivates students to acquire strong communications skills, foundational English education, and facility-specific general education knowledge. - Invite third-party Pratham observers to audit activities at all Anganwadi facilities to ensure accountability. - Submit quarterly reports to Integrated Child Development Services (ICDS). - Evaluate students before and after enrolling in the Anganwadi academic program. - Involve teachers, students, and Anganwadi faculty members in the feedback loop to make appropriate modifications. Interested to contribute to the Anganwadi initiative? 1. Click on the Donate link to the right. 2. Enter "Anganwadi" in the optional "For which program?" field. 3. Enter a one-time or monthly recurring donation amount of your choice. Bharatiyam will apply your funds towards operations, improvements, and expansion of its efforts.